In my teaching, I focus on cultivating learning environments that emphasize intellectual curiosity and sharing projects-in-progress. I have taught a range of writing courses and education seminars, including courses on student activism, civic engagement and community-campus partnerships, self-authorship in college, and sustainability narratives. I teach, research, and develop undergraduate and graduate student programming that includes multimedia composing and community engagement. In my first-year writing course “Writing for Change: Student Activism through Story,” for example, we consider the ways effective storytelling, in both traditional print forms as well as in digital and live contexts, can help to build communities, cultivate individual and public reflection, and inspire broader social change. 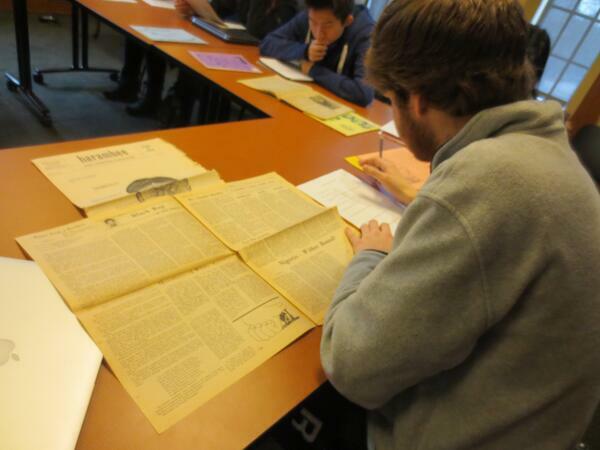 We research undergraduate student activism stories in the university archives, and use rhetorical and literary analysis to examine the strengths and limitations of these stories in the contexts in which they circulated. For the final project, writers create and present a personal digital story in which they reflect on our semester-long conversations and on their own commitments and personal philosophies. Rather than writing just about social change narratives, this final writing project asks students to compose a story for social (or personal) change. By presenting that story in a public forum, they gain practice in using story to work for change themselves. The digital storytelling experience gives students new tools to process what they’re learning about social change narratives and about themselves; it helps them move from collectors of knowledge and experience to reflectors who examine their life at one particular moment in time and produce a story that speaks to that. Community engagement is a core feature of this work, and so our central question as writers is this: “What do we want our research to do?” This approach to teaching is built on my research of community stakeholders in community-engaged learning projects and thoughtful consideration of multiple audiences for research.